1. Tell us about you, your shop, and why you create. Priddy Creations specializes in camera accessories for the every day mom to the professional photographer. Additionally, our product line includes custom totes and bags and other accessories. All of our products are handcrafted in our smoke free studio using only the best materials. Rest assured that you will be getting a top quality product. All of our fabric creations have finished seams, re-enforced stitching and are top stitched where necessary for a lasting item. Custom orders is our specialty and we would love to help you create that perfect item to fit your style and personality. Shoot in style! I love anything crafty and expressing my tastes and personality through design. 2. What is the best memory/event you have from creating? I think the most exciting thing is when I sell that first item when creating a new product! Nothing beats that! 3. What is your favorite item, or what is your best seller? My favorite item(s) are my camera bags. I love being able to create a unique and individualized product that lets a person stand out and their personality come through. 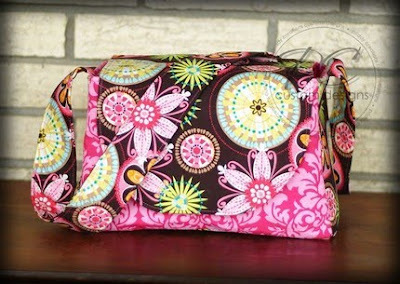 My best seller is my Carnival Bloom & Passion Damask Camera Bag. 4. Share something you’ve learned from creating? With sewing, measure TWICE and cut once. I can’t tell you how many times I have messed up the measurements when cutting. Also, patience. Sometimes designs don’t turn out how you pictured in your head. 5. When you are stressed, have too much to do, or need a break, how do you relax? READING! That is the most relaxing hobby I have! I love losing myself in someone else’s story! Hey Whitney, I found you through Blair's blog. Your work looks amazing. I see the biggest items you create are camera and labtop carriers…. I have been searching everywhere for a diaper bag. Have you considered creating one? I love Amy and her work!